It's been a week dominated by Google. The Nexus 7 tablet looks to finally be the product that we've all been waiting for – a decent Android tablet for under £200. We've had a play with it and can report that we like it very much…. Ever since Android starting making its way onto tablets the market has been crying out for an aggressively priced product. 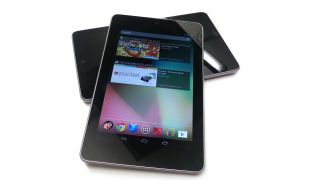 So it's not before time that Google finally launches its own device, a 7-inch, 8GB tablet for just £159. The Nexus 7, which weighs in at just 340g, packs a 7-inch screen with 1280x800 resolution and is powered by a quad core Nvidia Tegra 3 CPU, is also available in 16GB flavour for £199. For the money you're getting so, so much: a quad core Tegra 3-powered device with a 12-core GPU and a HD screen. Then there's the most advanced version of Google's Android, and the fact you can get a wealth of new content in the shape of magazines and an ever-growing library of content in the video department. Along with the Nexus 7, Google also just announced an Android-powered media streamer named the Nexus Q. Think Apple TV with open standards but an even higher price. The idea is that you marry the Nexus Q with your Android smartphone or your Nexus 7 tablet, and stream music or movies through it to your TV. Google is obviously taking shots at Apple and its iOS and Apple TV setup. That said, the Nexus Q is a whopping $299 (through the Google Play store). That's a lot to pay for a device that essentially does less than competing solutions, and offers a confusing counter to the Nexus 7's reasonable pricing. We look forward to giving the Nexus Q a proper test, but for the time being that price looks a little bit too high. While Apple doesn't own the exclusive rights to the super-skinny notebook guest list any longer, it is still the market leader. But while the latest MacBook Air impressed us greatly, the wow-factor has worn off slightly, due to this being the third iteration of the current design. In a market becoming densely populated with slim-line laptops from a massive range of manufacturers, Apple still holds the trump card with the MacBook Air - but only just. And as such, we fully expect a design overhaul from the Cupertino-based tech giant in 2013. The LG Optimus L7 may have style, but it doesn't quite hit the mark compared to the competition, with too much thought put into the design making the user experience feel forgotten and rushed. It does have a decent 4.3-inch display which provides strong, vivid colours and smooth video playback. The inclusion of NFC is a nice feature, along with the programmable Tag+ sticker included in the box, which makes the technology more useful than just having NFC alone on the handset. We were also impressed with the battery in the Optimus L7, which can easily last a couple of days with moderate use. But all these useful features are sadly put on the back burner thanks to the incredibly slow processor and user experience.